Select your bookstore below the synopsis and click on the link to read Ayann #1 A Fantasy Action Adventure: Part A. Most stores have the first book listed for "FREE". 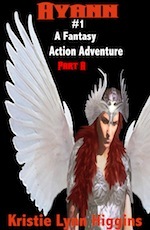 Ayann The Valkyrie braves the dungeons and crypts of her world in search of adventure, glory, and riches. She ventures with her party that includes a paladin, an archer, a priestess, and a barbarian. Little does Ayann know that her greatest and most perilous venture lies ahead of her and her party.